Margie Richard secured agreement from Shell Chemical to reduce its toxic emissions by 30 percent, contribute $5 million to a community development fund, and finance relocation of her Old Diamond neighbors in Louisiana. Margie Richard grew up in the historically African-American neighborhood of Old Diamond in Norco, Louisiana, in a house just 25 feet away from Shell Chemicals plant’s fence line. Years later, she would lead the front line of a long, hard-won battle to hold Shell accountable for the devastating health problems in her community. Richard, whose campaign has been hailed as a landmark environmental justice victory, holds the distinction as the first African-American to win the Goldman Environmental Prize. Four generations of Richard’s family have lived in Old Diamond, a neighborhood within the southern Mississippi River region known as “Cancer Alley.” Old Diamond is plagued with reportedly high rates of cancer, birth defects and other serious health ailments among the 1,500 residents who lived on the four square blocks sandwiched between the Shell plant and a Motiva oil refinery owned by a Shell subsidiary. More than a third of Norco’s children suffer from asthma or bronchitis. Richard’s sister Naomi died at age 43 from sarcoidosis, a rare bacterial infection. The disease typically strikes one in a thousand people, yet Richard knows of at least three other neighbors who suffer from the same sickness. Shell has been a fixture in Norco, located 25 miles west of New Orleans, since 1929. Over the years, the plant, with its looming tanks and belching vapor stacks, has grown to the size of nine football fields. The corporation has steadily bought out property from neighboring residents, many of whom were descendants of slaves and sharecroppers who farmed the land in the days before the Civil War. Other families simply fled to escape the health hazards associated with living in Old Diamond. Most of the ones who stayed were trapped by socio-economic conditions and other family responsibilities. According to Richard, the defining event in her decision to become an activist occurred in 1973 when a Shell pipeline exploded, knocking one house off its foundation and killing an elderly woman and a teenage boy who was mowing the lawn. Richard recalls dashing out of her mother’s house one block away and spotting a body lying beneath a sheet and the 16-year-old boy, then still alive, covered with raw burns and bubbling blisters. In 1988, another major industrial accident killed seven workers and released 159 million pounds of toxins into the air. Richard got in the habit of sleeping in her clothes so she could be ready to jump out of bed and run for her life if needed. In 1989, Richard, then a middle school teacher, founded Concerned Citizens of Norco to seek justice from Shell in the form of fair and just resettlement costs for her family and her neighbors. Over the next 13 years, Richard led a community campaign that was equal parts hard science, grassroots organizing and media savvy. She joined forces with environmentalists and researchers to release a report that showed that the Shell refinery in Norco releases more than 2 million pounds of toxic chemicals into the air each year. In addition to serving as a community representative on a high-level EPA regulatory committee, she took her battle to the courts, acting as plaintiff in a high profile but ultimately unsuccessful class action suit against Shell. She has organized press conferences and local “bucket brigades,” empowering her neighbors with specially outfitted plastic buckets so they could monitor hazardous air pollutants on their own as well as educational workshops sponsored by Xavier University’s Deep South Center for Environmental Justice. Richard also has a sharp eye for political theater. At one point she had a Web camera installed on her trailer home to broadcast live feeds of the refinery spewing petrochemical byproducts. While speaking at an international environmental conference in Holland, Richard approached Shell officials and invited them to take a sniff from a bag of Norco air. Her untiring efforts have attracted powerful allies including U.S. Rep. Maxine Waters and helped spur an investigation by the EPA that faulted Shell for failing to ensure plant safety and for falsifying its emissions reporting, a practice confirmed by a company whistleblower. Throughout the campaign, Richard, who the local media called Norco’s “chief rabble-rouser,” faced stiff resistance from Shell officials who aggressively discouraged her group from seeking outside counsel and refused to hold open meetings with community members. In 2000, thanks largely to Richard’s efforts, Shell agreed to reduce its emissions by 30 percent and improve its emergency evacuation routes. Shell also agreed to pay voluntary relocation costs for residents who lived on the two streets closest to the plant. But Richard and Concerned Citizens turned up the heat, leading to a meeting at the Shell offices in Norco where they secured a $5 million community development fund and full relocation for all four Old Diamond streets. Since the agreement was brokered in 2002, Shell has bought about 200 of the 225 lots at a minimum price of $80,000 per lot. In addition to being the first community relocation victory of its kind in the Deep South, Richard’s success in Norco was an inspiring example for activists nationwide battling environmental racism in their own backyards. People of color are more likely than whites to live near areas polluted by industrial plants; seventy-one percent of African-Americans live in counties that don’t meet federal air pollution standards. As a consequence, studies show that black people suffer disproportionately from respiratory and other environmental ailments. Community protest against these conditions produced a uniquely American brand of activism that is equal parts civil rights and environmentalism. Richard stood at the forefront of this important social justice movement. After passing her presidency of Concerned Citizens to another member, Richard became an activist-at-large. She continued to work with Shell on an initiative to improve community and environmental health and safety in Norco. She also advised other communities battling corporate pollution including the African-American neighborhood of Westside in Port Arthur, Texas, which borders a refinery owned by Premcor, one of the nation’s largest independent oil refineries. Port Arthur has the highest rates of respiratory illness in the state; more than 20,000 children in the area are exposed to toxins that can cause cancer, learning disabilities and birth defects, according to a recent study. Richard’s activism has also taken her abroad. In 2002, she spoke at the World Summit on Sustainable Development and met with citizen groups in South Africa struggling with contamination from industrial run-off. She has also participated in international delegations to Royal Dutch/Shell’s annual general meeting in London where she pressured the corporation to take responsibility for its dirty industrial practices and the medical costs associated with treating environmental illness. Margie Richard, receiving her award at the 2004 Goldman Prize ceremony from the founder, Richard Goldman. 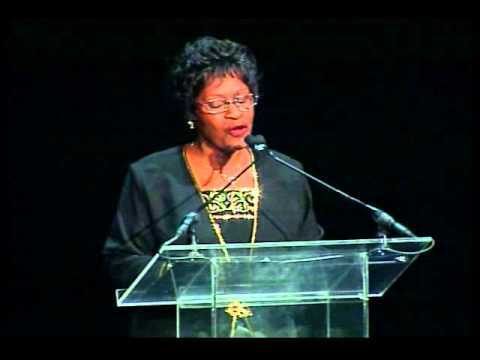 Margie Richard, accepting her award at the 2004 Goldman Prize ceremony. Margie Eugene-Richard, 2004 Goldman Environmental Prize Winner, North America (United States).